Well it’s here, and it’s earlier than usual: THE NHL TRADE DEADLINE. As my wife is watching the never-ending oscars, I’m in the office reading up on all the NHL rumors I can find. This has traditionally been my favorite day of the year (if you exclude birthdays and wedding anniversaries) since I was 7 years old. I remember racing out to the car after school, making my Mom turn on WGR and waiting in anticipation to see if the Sabres made any trades. I remember sitting at the kitchen table with my Dad when I learned Dave Snuggerud was shipped to the Sharks for Wayne Presley, and we picked up Dave Hannan from the Leafs. I felt sadness in losing Snuggerud because of his incredibly awesome name, but I was excited to get a guy they could play Elvis songs for. I remember delivering papers in the snow when I heard we’d acquired Petr Svaboda from Montreal for Kevin Haller. I was rushing out of my shift at Outback as a busboy to learn the Sabres not only scored Steve Heinze #57, but we reacquired Donald Audette! One year in the basement, I learned Michael Grosek was traded for Doug Gilmour, and the ‘toss in’ J.P. Dumont? Hell ya! Or what about the awesomeness of trading Holzinger, Primeau and Sarich for Chris Gratton? Whoah, okay! (See??? Darcy USED to make BIG trades) And then that same undercheiving Gratton gets shipped to Phoenix a few years later for Danny Briere. Best trade in Sabres history? Probably. Although, it was on another deadline day that Darcy bamboozled the Florida Panthers by trading Mike Wilson for Rhett Warrener and the 5th round pick that turned out to be Ryan Miller. I’d say that worked out pretty well too, especially considering we then used Warrener as a key piece to get Chris Drury a few years later. Of course, some tra de deadlines were rougher than others, like the year we sent Razor off to the Sens, and Stuuuuu Barnes to Dallas for the incredibly bland Mike Ryan. But, that’s also the year the Sabres acquired Briere. It was a bum when Marty Biron had to go to the GD Flyers so we could make room for Zubrus (ouch). Sure he was okay in the playoffs until he got hurt, but it marked the first in a string of crappy deadline pickups for a few years (see Moore, Dominic or Torres, R.). 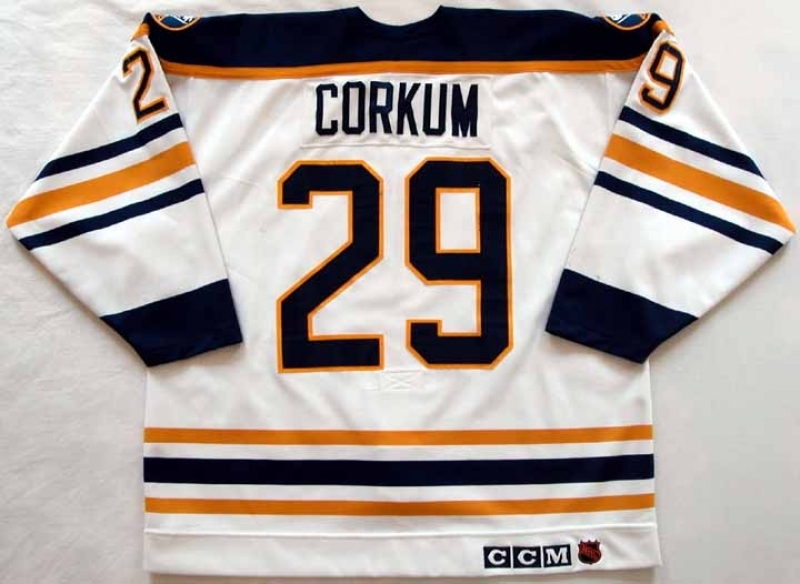 Actually, that string might have started off with the re-acquisition of Sabres’ great Bob Corkum. What a stellar let-down, considering I had tickets to the game that same night with my pal Bob. Let’s hope this year isn’t a disappointment for Sabres fans. With new ownership in the Pegulas, it’s as exciting as ever. I welcome any kind of movement for this team, as it really is my favorite part of being a hockey fan. While it wasn’t a deadline deal, nothing will ever make my jaw drop like my Dad walking up the driveway, informing me that the Sabres had traded for Pat LaFontaine. So enjoy this deadline day! Looks like the Sabres have already grabbed Brad Boyes from St. Louis. I say bring on JM Liles, Stastny, Rochards, Grabner, Gilbert or Weiss. . . .Not Hemsky though. I don’t care for his game. Do you have any special memories of Sabres trade deadline deals? Let’s hear them. .Â .